If what you plan to spend your cents on is a fully capable portable emergency radio that does exactly what it has been designed to do, perhaps it’s high time you had a look at the specs of the RunningSnail MD-090. This product is an efficient model that can be charged and powered via different energy sources, and the most remarkable advantage it offers is the fact that it can act as a charger for your mobile devices. Besides, the RunningSnail can be utilized as an LED flashlight in your time of need. While researching the RunningSnail MD-090, we didn’t come across any serious complaints. However, there was a customer who has reported that the audio quality of this emergency radio might be less satisfactory. Perhaps it is worth noting that such a portable and compact option is not a professional piece of equipment and needs to be utilized for the occasional sunbathing or when disaster strikes in your area. Since the same individual took the time to underline that he or she was able to get most powerful stations, the sound quality isn’t all that big of a disadvantage. Weather alert radios aren’t the most expensive devices you might want to get at some point or the other. However, we’ve noticed that many prospective buyers have second thoughts when it comes to breaking the bank just for such a purchase. Fortunately, the RunningSnail MD-090 can be found for as little as seventy dollars or less and we feel compelled to underline that Amazon usually organizes sales and discounts and often sells it for half the price. In other words, if you’re planning to organize your budget as effectively as possible, maybe this is the model you need. 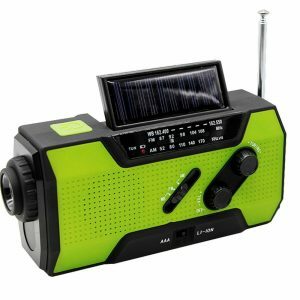 The RunningSnail MD-090 is capable of receiving and broadcasting the signal of most AM, FM, and NOAA weather bands in your area, complete with hazard alerts. This feature is the exact detail you may be interested in if you want to rest assured that you, your family and friends will be able to keep up with the most important weather notifications in your state. Besides, the RunningSnail model does a great job when it comes to helping you out, since it can be utilized both as a radio and as an LED flashlight. Just in case you ever feel like getting in touch with the police or calling an ambulance but your cell phone battery is dead, you may safely use the charging port in the RunningSnail to get in contact with the rest of the world. The model can be charged via four different possibilities. 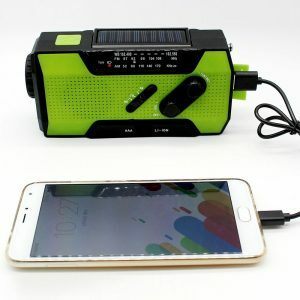 One has the freedom to utilize the rechargeable lithium battery provided in the pack, simply place the radio under the sun and allow solar energy to power up the device, charge it via hand crank, or make use of a separate AA dry battery. In a nutshell, it’s almost impossible to render this unit unusable.